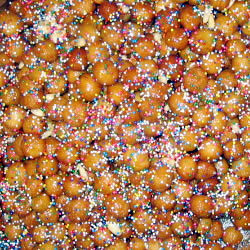 Strufoli (Italian honey balls) | What's Cooking at the Genua's? This is a reposting of a previous blog from last year! Still a timeless treat no matter what the holiday is, and this time it’s for Easter! So give them a try! They are not hard to make, honest!! I’ve never seen these with sprinkles… so fun and festive!! What scrumptious strufoli! I love these! They are a classic and oh so yummy for sure!